A tropical sunset over the Bahia de Siguanea, Isla de la Juventud, Cuba. The Isla de la Juventud (Isle of Youth) is the largest island in the Archipielago de los Cannareos off Cuba's southern coast. 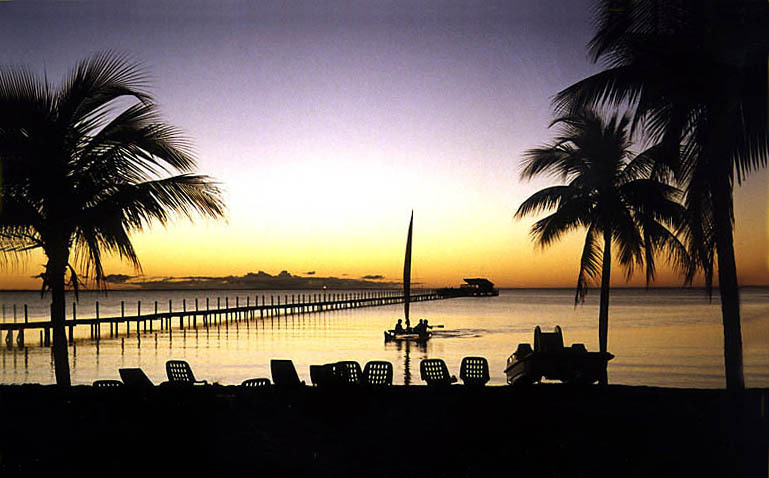 This photo is of the Mojito Bar at the end of the pier located at the Colony Hotel, part of the International Scuba Diving Center on the island. 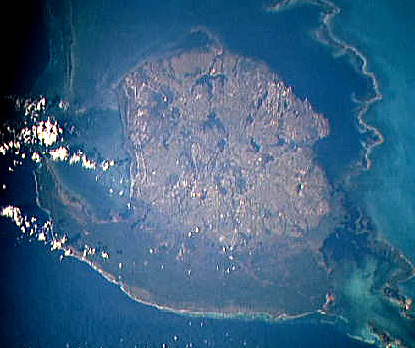 This spectacular overview of Isla de la Juventud, Cuba is courtesy of NASA and was taken from the International Space Station. The Bahia de Siguanea where the sunset photo was taken is the large bay on the westward (left) side of the overview where the clouds are. The bay is also where many of the spectacular scuba diving sites are located, as it was a valued sheltered anchorage during colonial and pirate times. The island is approximately 50 kilometres across.